A Nov. 27 forum at Samford University focused on transition and assimilation challenges faced by international students. 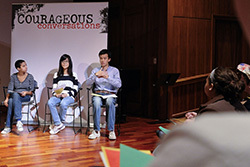 Sponsored by Samford's Mann Center for Ethics and Leadership, the Courageous Conversations event brought together a diverse crowd of American and international students to "Culture Shock: The Life of a Chinese Student in the South." "This is not a presentation. It's a conversation," said John Knapp, Mann Center director. A panel of students led the conversation by asking for the audience's reaction to certain questions like, "Are you comfortable talking to someone that has difficulty speaking English?" Over time, the conversation naturally progressed as audience members directed questions to each other, and students stood up to give their replies. The four student moderators were junior history major Darren Gray, senior graphic arts major Monica Longoria, freshman undeclared major Rebecca Liang and senior accounting major Kirby Xu. Both Liang and Xu are from China. Angela Ferguson, Samford's director for international initiatives, was also helped with the discussion. She explained the demographics of the international students on Samford's campus. With 67 graduate students, 51 undergraduates and 77 students enrolled in the English Language Learner Institute, Samford's international students represent 22 countries, and 85 percent of these students come from China. As the conversation focused around culture shock, one American student posed the question, "What can I do for Chinese students to feel more comfortable around me and my friends? I am so worried that I am going to accidentally offend them by doing something wrong." The Chinese students present gave a variety of answers. One student said it would help if people would just smile and be warmhearted. Another explained her dilemma with American jokes, saying she wished people would simply explain them to her. "When we are talking, sometimes people start to laugh, and I don't understand. I translate the conversation word-for-word, but I don't find it funny. Instead of saying, 'oh, it's nothing,' it would make me feel more included if someone would just explain it to me," she said.